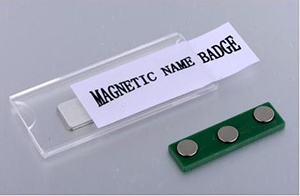 Magnet name tag is composed of strong neodymium permanent magnets , iron or plastic materials. It is applied to clothes including coats, suits, down garments and so on. 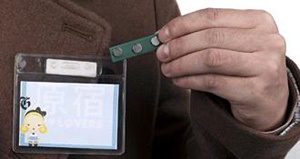 Instead of bringing damages to clothes like conventional name tags do, magnetic badges are fixed to clothes by the attracting force of magnet to the steel part in them. Though the price of magnetic tags might be relatively higher than conventional name tags, considering the fact that valuable clothes which may worth hundreds to thousands dollars are saved from poke holes, the difference is prices are not worth mentioning. Besides, the tags can be replaced easily with low replacement cost. Personnel name scrip can be arbitrarily specified or DIY, which greatly saves office costs. Magnetic name tag belongs to magnetic assembly, is the most ideal product for advertising, publicity, promotion, tourism, memorial, opening and celebration. 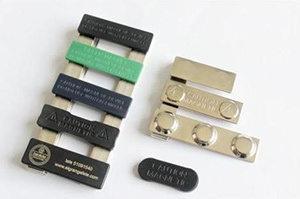 China Rare Earth Magnet Limited supply a variety styles of magnetic badges. We have standard sizes and models as in the following picture. And we also welcome you to send us your own design and drawing. We can customize such permanent magnet assembly as per your specifications. This product contains high strength neodymium magnets. Do not allow children to play or to swallow. Please remove the magnets from the back of the name tag and place it to the inside of clothes, place the card face to the corresponding outside place of the clothes. These two parts will be attracted.